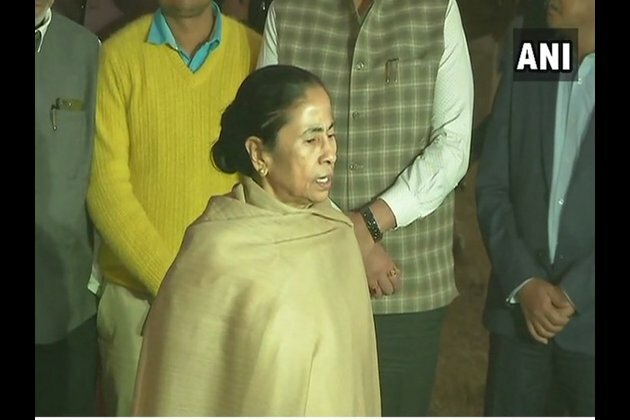 Kolkata (West Bengal) [India], Jan 17 (ANI): West Bengal Chief Minister Mamata Banerjee on Thursday said that the Trinamool Congress (TMC) rally, to be held here on January 19, is a demonstration of the unity of the opposition parties in India and a platform to battle against the BJP in the coming Lok Sabha elections. Addressing the media, Mamata said "many leaders" including SP chief Akhilesh Yadav, NCP leader Sharad Pawar, JD(S) leader Deve Gowda, DMK supremo M K Stalin and BSP leader Satish Mishra will be coming tomorrow. AAP convenor and Delhi Chief Minister Arvind Kejriwal and RJD leader Tejashwi Yadav will be coming on Saturday. She said others who will attend the rally include NC leaders Farooq Abdullah, Omar Abdullah, Karnataka Chief Minister HD Kumaraswamy, Andhra Pradesh Chief Minister Chandrababu Naidu and Congress leader Mallikarjun Kharge. "This will be a United India rally. It's a platform to fight the battle against the BJP, the 2019 (Lok Sabha elections) being the battle. Every political party will give its message," the TMC supremo added. She further said that this rally will be "historic" like the rallies organised by former West Bengal Chief Minister Jyoti Basu in the year 1989 and anti-Emergency leader Jayprakash Narayan in the late 1970s. When asked if the rally will mark the 'death knell' for the BJP, Mamata said: "Obviously, it has started already". She claimed that the BJP will not win more than 125 seats in the coming Lok Sabha elections. "Even if they win 125, it will be enough," the TMC leader added. She also said that the regional parties will be "decision-making factor" this time. In reply to questions on the critics of the unity of the Mahagathbandhan, Mamata said, "Every political party has their own vision, philosophy, we respect all of that. I don't think there will be any problem. This 'Mahagathbandhan' will be a gathbandhan of the people and the political parties will be with the people." Mamata has been touring the country since the past year in an effort to shore up a strong and united opposition front to fight the Lok Sabha elections against the BJP.